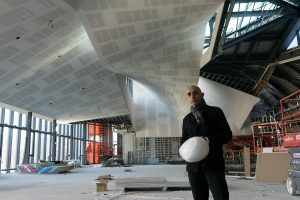 PHOTO BY NEILAND BRISSENDEN/GLEANER NEWS: Architect Nader Tehrani (above) wanted to emphasize interconnectedness within and without in One Spadina. It was a challenge, he said, to “design a building whose main audience are designers of urban landscape”. On a cool, crisp morning in early November,­ two architects in anticipation flit about a light-filled atrium like children on Christmas morning. Their excitement is palpable as they prepare to unveil a sneak peek of One Spadina Crescent, which for the past several years has been a boarded-up construction site. The Gothic Revival building dates back to the mid 1870s when the Presbyterian Church bought the land from the Baldwin family and built Knox College on the circular site. Since then its many incarnations have included medical laboratory, miscellaneous university offices, and ghostly ruin. The mishmash of little warrens even provided a home to this newspaper at one point. But as this day revealed, One Spadina — due to open in 2017 — is almost ready for its next iteration as home to the University of Toronto John H. Daniels Faculty of Architecture, Landscape, and Design, a home that Richard Sommer and Robert Levit are eager to share. The building has both undergone a renovation and gained an addition. Its historical elements — a prominent staircase, arched hallways, and fine masonry — have been carefully uncovered and restored. The wings of the old building have been filled in to create interconnected space, and a north-facing glassed-in conservatory-like annex adding undergraduate and graduate studios that are marked by transparency from within and without. The studios that look down on to a Principal Hall able to accommodate up to 400 people can also be looked upon from outside. The effect is, as Levit, the director of the faculty’s master of architecture program, said, “super, super dramatic”. The university is aware that One Spadina is a marquee project for the university. It denotes a new gateway to its St. George Campus (consider the difference between this building and the now infamous graduate house at Harbord Street and Spadina Avenue), and models how to integrate new into old. Perhaps most importantly, though, it also marks a new openness with the community and city in which it finds itself. Meric Gertler, the university’s president, stressed that the faculty and its new home on a prominent avenue in Toronto will be a conduit for learning, and play a key role in citybuilding. With such heavy expectations appended to the structure, it’s perhaps surprising that the building feels so light and airy. And yet it does. Openness marks the space, in which long bright corridors give way to even bigger and brighter offices and laboratories. That sense of interconnectedness — between past and future, town and gown, within the building itself — was done by design, explained architect Nader Tehrani. “It’s a wonderful, great place,” said architect Eberhard Zeidler, a member of the Order of Canada whose many designs include the Eaton Centre and Ontario Place. He and his wife are prominent donors to the project, and One Spadina’s library, located in the building’s original cloister, will be named for him. He also underscored the need “to reuse that old building and make it new again”. Indeed, it’s so cherished by the local community that block studies aim to protect the view of its spire from north and south. At one point, admitted Rory “Gus” Sinclair, the Harbord Village Residents’ Association (HVRA) even worried that the addition itself would be higher than the spire. But now, said the past chair of the HVRA, “Old Knox College never looked so good”. But even the view is two-sided: just as the community strove to guard the view to the building, so too has the university carefully protected the view from the building, establishing the Paul Oberman Belvedere. The large raised terrace, said Sommer, “will restore this site in its role as a prospect to the lake”. He explained that Oberman was a real estate developer known for “bringing significant heritage properties back to life and integrating them back into the city”, making the belvedere emblematic of the building itself in more ways than one. And so it goes with One Spadina: a building that contains more than itself.